THE Marsh brothers were among a bunch of batsmen who blew a chance to find form on Saturday in Sheffield Shield ranks. While Test incumbent Marnus Labuschagne made 52, Shaun Marsh (21), his brother Mitch (1), Peter Handscomb (4) and Matt Renshaw (21) fell cheaply in Shield games. Shaun Marsh resumed on nine against South Australia on Saturday in Adelaide but barely settled before nicking to first slip. Sibling Mitch lasted only four balls, playing defensively and edging to second slip. In Canberra, Queensland opener Renshaw's bid to press his claims was cut short by Test spinner Nathan Lyon. Renshaw, facing NSW's Test-strength bowling attack, survived 68 balls before being caught behind, one of Lyon's four victims. Another Queensland batsman in the conversation for next month's Test series against India, Joe Burns, made just six before falling to Test quick Josh Hazlewood. Labuschagne found form with six boundaries in his half-century batting at first drop. Blues paceman Pat Cummins took 3-41, Mitchell Starc 1-71, Hazlewood 2-53 and Lyon 4-83. That quartet is certain to feature in the series opener against India from December 6 in Adelaide. Batsmen around the country found scoring difficult as the national team prepared to take on the Proteas in Saturday night's one-off T20. 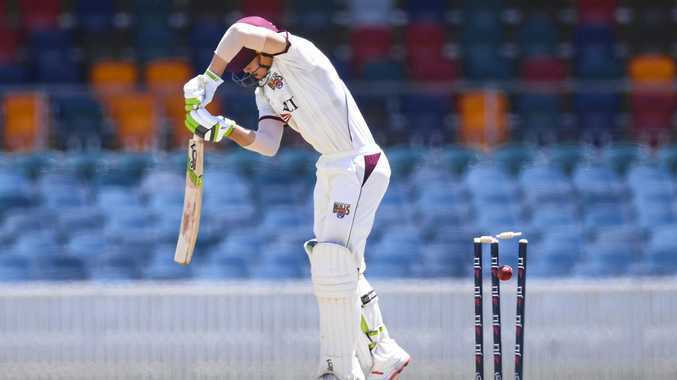 Tasmania - featuring Test captain Tim Paine and former Aussie stars George Bailey, Alex Doolan and Matthew Wade - was bowled out for just 81 on the opening day of their clash against Victoria. Doolan has already plundered scores of 115, 76, 53 and 90 but his unlikely bid to win a Test recall took a dent when he was lbw for a duck. Wade had also put forward a strong case to be brought into the middle order as a specialist batsman but bombed out against the Bushrangers. A strong end to last summer combined with a red-hot run of form this Shield season in which he had scored consecutive, unbeaten half-centuries led some to speculate he may wear the baggy green again but he was one of Scott Boland's two victims, dismissed for 14. Travis Head starred for South Australia with 87 on Friday but Callum Ferguson and Jake Lehmann failed to reach double figures. Moises Henriques, who played his last Test in 2016, has been the standout this round, smashing 152 off 178 balls for NSW against the Bulls on Friday.